The first thing I loved about this book (and this is a frequent factor in all of Jodi's books) was that I felt like I learned a lot while I was reading it. This book was all about Osteogenesis imperfecta which I didn't know much about and now I feel so much more knowledgeable on the disease. Not only did this book introduce me to new diseases, I loved the little facts throughout the novel. This was part of the story but they were cute and interesting, for example, did you know that the hundred billionth crayon made by Crayola was Periwinkle Blue and that a tuna will suffocate if it ever stops swimming! Another nice touch were the recipes. These are only included every now and then and, at first, I didn't understand their relevance but at the end everything became clear! It was really nice how they were a subtle link to the chapters ahead. I also enjoyed hearing Amelia's opinion on the situation and how she felt going through the trauma's her family had to deal with. It was interesting to hear all of the narrator's opinions. My favourite character was Amelia because I felt like I understood how she felt the most and I could relate to her. Lastly, I felt like this book made me realise how lucky I was to be healthy and to have a supportive, healthy family. You never know how hard it is for people in situations like this and I think this novel gave me a clear insight into their lives. I recommend this book to anyone who likes contemporary, knowledgeable and new adult books. There are a few triggering scenes and the book can be upsetting at times (there was one scene that made my cry but that could have just been my personal attachment to the situation) but altogether I really, really enjoyed it! To carry with you the name of the tree that bends instead of breaking. Parents aren't the people you come from. They're the people you want to be when you grow up. She liked to draw the birches because she said they were tragic, and that something so beautiful shouldn't have to die so quickly. I haven't read anything by Jodi yet and I want to . I hear so many good things about her books, and since you praise her, where do you think I should start? She has many books to choose from! I loved My Sister's Keeper (the movie) so I know her work is going to be great. I just need some suggestions on what to read first lol. I literally recommend any of her books! It depends what you find interesting. Do you like law or science or history? Court cases ?!! Right up my alley. Which ones are those? I like the quote about the kinds of pain you can't speak aloud! 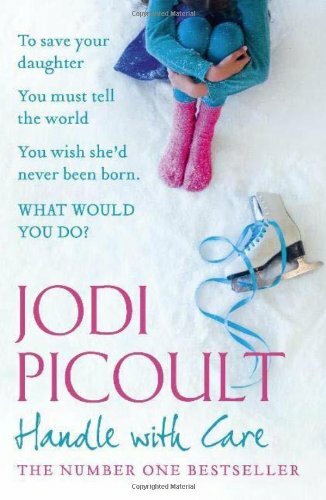 It seems like this another Jodi Picoult book you managed to enjoy a lot. I was just reading another book review on the blog Brandi Breathes Books where she also mentions the same kind of disease although it is a different book. It is always awesome to be able to learn something new from a book. Yeah, there were so many lovely and relatable quotes throughout this book but I didn't want to write them all down so I just chose a few of my favourites! I agree; I love learning new things and I learn something guaranteed from all of her books!